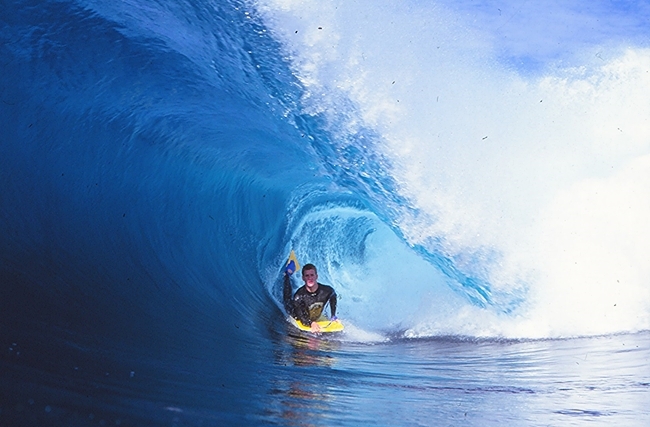 When Ryan Hardy made his first trip to the Northshore there was big expectations for the West Australian bodyboarder. He had been quietly building up a solid reputation at home and now if he wanted continue on the path as a pro bodyboarder he had to prove it on the World stage. Hardballs took to Pipe quickly and by the end of the 95/96 season all fears were laid aside as he had definitely left his mark. Rhino with a Pipe reverse , photo Stroh. Watching Ryan Hardy tube ride you can see the little shifts , turns and body movements that he does that makes it look so easy. The truth is he’s spent years honing these skills and the final result is that Hardballs is now one of the best tube riders in the sport. This pic Shark Island by Stroh back in the 4 Play board days. Before Ryan Hardy made a name for himself internationally for years he was charging the biggest and best waves that West Oz is famous for often alone. Growing up Ryan surfed by himself most days often way out to sea on reefs that few others dared venture out to. Here’s Rhino on one such day below taking a large one at Cross-waves. Photo Holtzy. This snap of Ryan “Hardballs” Hardy was taken in ’98 at a then secret spot on the Central Coast. To keep it low key Tim Jones the photographer ran the shot in reverse in this Billabong adv.